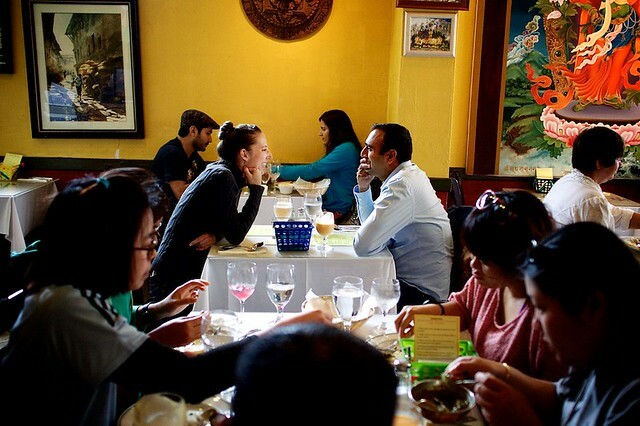 Today, they came again, at the grand reopening of Karma Kitchen in Berkeley. Unbeknownst to Teresa, Anupam had already been in touch with the coordinators to ask if they would assist him with a very special surprise. He didn't have to ask twice :) Conspiracies of love are what Karma Kitchen thrives on. When they were seated at their strategically positioned table, the unsuspecting Teresa excused herself to visit the restroom. Anupam delved into his pocket to pull out two precious items that were covertly handed off to the servers: A little velvet jewelry box ---- and -- the wooden keychain from two years ago that Teresa had kept on her dresser and treasured ever since receiving it. "If you could bring it out before the meal that would be perfect." he said. It was the final countdown to --- Proposal Time! In the kitchen a flutter of excitement ensued, amidst ohs and ahs as backend volunteers opened the box and caught sight of a beautiful ring. Together they prepared a one-of-a-kind platter for it. 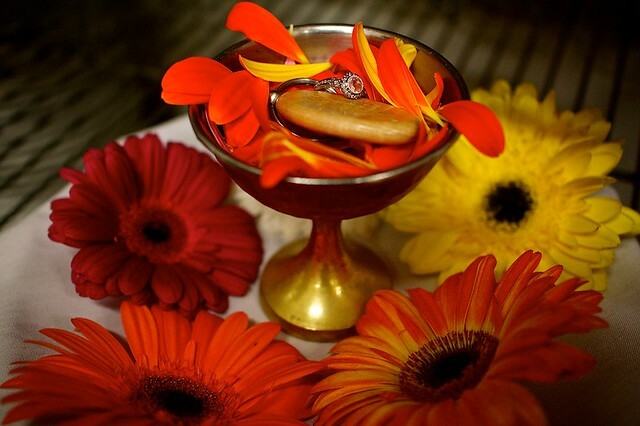 The ring was attached to the special keychain and placed on a bright bed of flower petals nestled into a copper dessert goblet balanced on a serving tray decorated with Gerbera daisies and a smile card :) Then, as all the volunteers silently filed to the front, Kara -- their server, carried over the special delivery! Needless to say, Theresa was totally and fantastically surprised. Love magnetically spread through the entire space. It says a lot about a couple who met in a space of generosity and chose to make a life commitment in that same spirit. A volunteer sang a beautiful song, as random strangers wrote blessings for the soon-to-be couple. Red roses were gifted to other couples in the restaurant. And there were big smiles all around. Particularly Theresa, who was naturally quite taken by Anupam's grand surprise. As Ram Dass once said, "The most important aspect of love is not in giving or the receiving: it's in the being." It felt like a privilege to be together for this special moment. May we all keep loving, and spreading that love to all living beings. Congratulations, Anupam and Theresa. Thank you all! 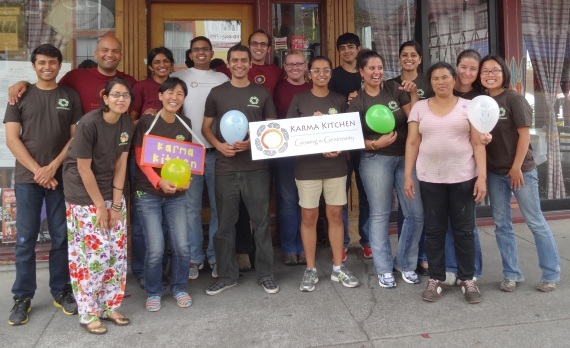 Special thanks to Rishi for capturing these magical moments, and thank you ALL for making Karma Kitchen all that it is -- particularly the volunteer crew who served so selflessly. incredible story and incredible photos rishi! Lovely account Praveen! Thanks for putting the occasion in context. what a beautiful story and such amazing pictures! Congrats Anupam & Theresa! brought many smiles and tears..the thought of gifting roses to the other couples just expands that magical moment. Thank you Praveen, Rishi and all the crew. Yesterday was truly a special day that Theresa and I will remember for the rest of our lives. Thank you so much for making it special for us. While we knew that this would be a special moment for us and our family/friends, it was especially wonderful to share this with everyone who happened to come yesterday. We were overwhelmed with the unexpected notes and well-wishes that the many people sent to us. One of the really nice things was seeing how the roses that we put on the gift table were gifted by the volunteers to other people yesterday. 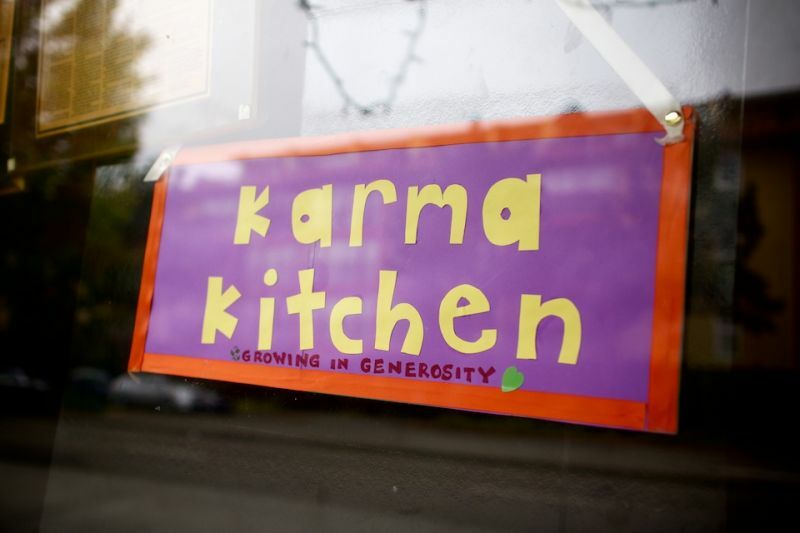 Our experience with Karma Kitchen started with a gift, and it was so nice to bring this full circle. Definitely a very touching story! Congratulations, Anupam & Theresa! What a blessing to be able to share this with us, your global family! 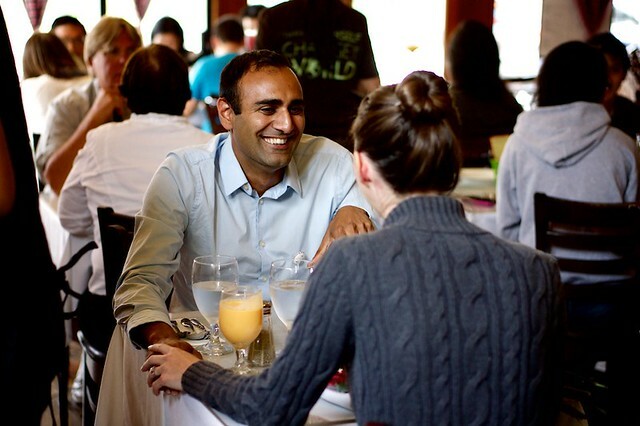 Thank you Karma Kitchen, thank you Rishi for the loving photographs, thank you Kara (miss you!) for the after love.... I feel SOOO blessed to be connected to this infinite circle of love... that I'm ∞∞∞∞∞∞∞∞ and ceaselessly passing the love on or as Pancho beautifully says, "weaving continuously and diligently these stories of the human soul to co-create the quilt of kinship among the Earth Community." Loving Kindness is indeed, unstoppable now! Thank you for giving humanity hope! Wonderful concept and amazing story. I wish to be there to saw that magic happening. I work in a Dennys restaurant where kindesses occur regularly. At first it was surprising to me: people buying a veterans meal or bringing in a homeless couple to enjoy a meal... Over time I am seeing that many people are now "paying it forward" or "spreading the word" that indeed "in the end, only kindness matters". This is definitely an increasing Movement, a shift that I am a part of. I love each kindness that I am a part of, partly because it washes back on me and bathes me in joy! And spending the morning on this cite is a wonderful way to refill my cup! So much good! I pray that this tsunami of kindness washes over every soul.